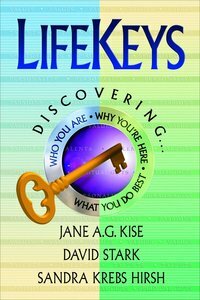 About "Lifekeys: Discover Who You Are (2005)"
Sandra Krebs Hirsh is a management consultant worldwide, providing career, leadership, and organizational development consultation. One of her books on the Myers-Briggs Type Indicator inventory has sold over two million copies. Jane A. G. Kise, Ed. D., is the coauthor of over a dozen books, including LifeKeys, Did You Get What You Prayed For? and Find Your Fit. In addition to school staff development consulting, she teaches seminars on prayer, spirituality, and finding meaning and purpose in life. She holds an MBA in finance from the Carlson School of Management and a doctorate in Educational Leadership from the University of St. Thomas. She and her family reside in Minneapolis, Minnesota.